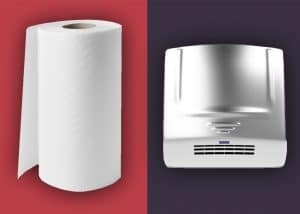 Ever since hand dryers became common in public bathrooms, business owners and customers alike have questioned what is better — hand dryers or hand towels. Hand dryers are more economical and better for the environment. Hand towels cost more but are more sanitary from the consumer perspective. Hand dryers last between 7 to 10 years. They have less environmental impact than hand towels. Using a standard hand dryer releases 0.02 pounds of greenhouse gas per use. Jet hand dryers, which are energy efficient, release 0.088 pounds per use. The environmental figures for paper towels rely not just on its use, but on the production, transportation and disposal. Paper towels must be restocked and disposed of more frequently than hand dryers, so their carbon footprint is generally bigger. Using two standard paper towels gives off approximately 0.123 pounds of greenhouse gases, over 5 times that of using a hand dryer. Figures for recycled paper towels are lower but still unavailable. A study was conducted by the University of Westminster – London that measured the amount of bacteria on people’s hands before washing and after drying them, in 3 different ways. First being paper towel, then traditional hand dryer and finally the new jet dryer. Hand dryers are not considered as hygienic as paper towels, and are known to spread bacteria. Results show paper towel to be the clear winner; decreasing the amount of bacteria by up to 76%. In comparison, both types of dryers increased the amount of bacteria by 1300 times, spreading fromour hands, not to mention the spread of cross contamination in public areas like toilets by more than 1300 times. Jet Dryers are capable of spreading bacteria from our hands and body up to 1.8 meters away, potentially contaminating others in the area. Traditional Hand Dryers can also spread bacteria up to 0.5 meter away. Paper towel has shown to spread no real spread of bacteria. The disposability of paper towels is what makes them so costly, and also what makes them so hygienic as the physical movement of drying the hands removes bacteria. Using paper towel, hands dry fast, usually within 10 to 15 seconds, which prevents cross-contamination because bacteria spread from wet skin. Therefore, drying hands with paper towels reduced bacteria on the hand prior to washing by 76 to 77 percent. 55 to 64 percent of bathroom patrons preferred paper towels while only 28 percent preferred hand dryers. Results prove that hand towel is more beneficial in public areas like offices, bars, restaurants and public toilets.